Jussie Smollett spent two days volunteering with Jesse Jackson Sr.’s nonprofit group, a key factor that led prosecutors on Tuesday to drop all charges against the actor for allegedly staging a fake hate-crime against himself. A letter from the Rainbow PUSH Coalition said the “Empire” actor spent “several hours volunteering” with the group on Saturday and Monday. “Empire” music director Rich Daniels also penned a letter in support of Smollett, where he highlighted the actor’s surprise visit to a Chicago-based arts school. “The charges were dropped in return for Mr. Smollett’s agreement to do community service and forfeit his $10,000 bond to the City of Chicago,” the Cook County State Attorney’s Office told The Daily Caller News Foundation. 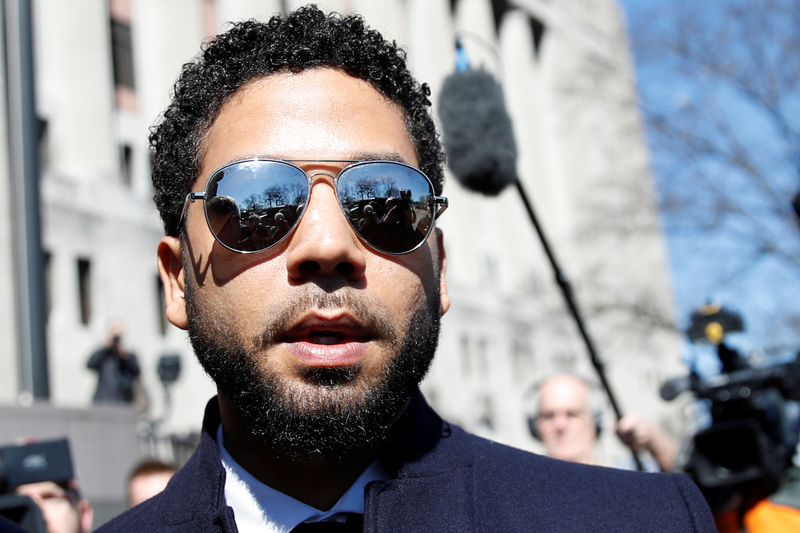 Jussie Smollett’s volunteer service with Jesse Jackson Sr.’s nonprofit group on Saturday and Monday helped convince prosecutors on Tuesday to drop all charges against the “Empire” actor for allegedly staging a fake hate-crime against himself. “The charges were dropped in return for Mr. Smollett’s agreement to do community service and forfeit his $10,000 bond to the City of Chicago. Without the completion of these terms, the charges would not have been dropped,” the Cook County State’s Attorney’s Office told The Daily Caller News Foundation. “Empire” actor Smollett, 36, faced 16 charges for allegedly filing a false police report claiming that two individuals wearing “Make America Great Again” hats attacked him on the street with a chemical substance and a noose. The attorney’s office provided a letter from the Rainbow PUSH Coalition which stated that Smollett spent “several hours volunteering” over the course of two days at the nonprofit group’s store, where he “met with staff and gave his suggestions” as to how to market its products to a younger demographic. The letter also stated the “Empire” actor spent “a significant part of his time” reviewing the group’s weekly broadcast and “encouraging” the production crew. The letter appeared to have been signed by Jesse Jackson Sr., the founder and president of the Rainbow PUSH Coalition. Smollett racked up a total of 18 hours of community service with the nonprofit group, TMZ reported. The attorney’s office also provided TheDCNF with a letter from “Empire” music director Rich Daniels, who highlighted Smollett’s work with non-profit groups outside working hours. Among the highlights was Smollett’s visit to a Chicago-based African-American arts school in January, where Daniels said the celebrity’s surprise visit inspired joy in children and faculty alike. Smollett also donated his “time and talent” for the taping of the “Chicago Voices” concert on PBS, according to Daniels. “Chicago Tribune critic Howard Reich indicated in his review of the national broadcast that the performance with Jussie was the highlight of the program,” Daniels wrote. Daniels also said Smollett “would perform at the national conference of The Kennedy Forum in Chicago”, attended a single meeting with the Executive Director of the Boys & Girls Clubs of Chicago, and appeared at a concert promoting “sound mental health” at The Kennedy Center in Washington D.C.
Also key to Smollett’s charges being dropped was his willingness to fork over his $10,000 bond to the City of Chicago Law Department. The attorney’s office told TheDCNF that its decision to drop Smollett’s charges does not exonerate the actor. “We stand behind the Chicago Police Department’s investigation and our decision to approve charges in this case. We did not exonerate Mr. Smollett,” the attorney’s office said in a statement.